This week I saw a trailer for a new movie coming out next month, called ‘The Greatest Showman’. It’s an American biographical musical about the showman P. T. Barnum, who lived from 1810 to 1891, and was from Connecticut, New England. He founded the Barnum & Bailey Circus, which ran for 146 years. Due to high operating costs and waning interest it closed earlier this year. Up until its closure it advertised itself as ‘The Greatest Show on Earth’. Around the time of the American Civil War, P. T. Barnum was probably the most famous man on earth. We’re thinking about P. T. Barnum this morning because he is one of our religious forebears. He was not a Unitarian, but a Universalist, so part of our broader religious family. Unlike some we claim to be our religious forebears, because of tentative Unitarian connections, or vague assertions they may have made along Unitarian lines, P. T. Barnum was very vocal and earnest in his Universalism. He grew up in a very Calvinistic home, being exposed each Sunday to fire and brimstone services. As such, he, as many children do who grow up in that kind of context, had a very real fear that he would fall short and find himself in hell. As a teenager he discovered the Universalist church, and with a wave of relief, recognised that a God of love could not possibly allow the eternal suffering of his children. He became a lifelong advocate of the Universalist Church. Also unlike other Unitarians we might think about, P. T. Barnum was not a philosopher, or a minister, or an academic, or a poet. He was a businessman. A businessman with a theatrical flair. 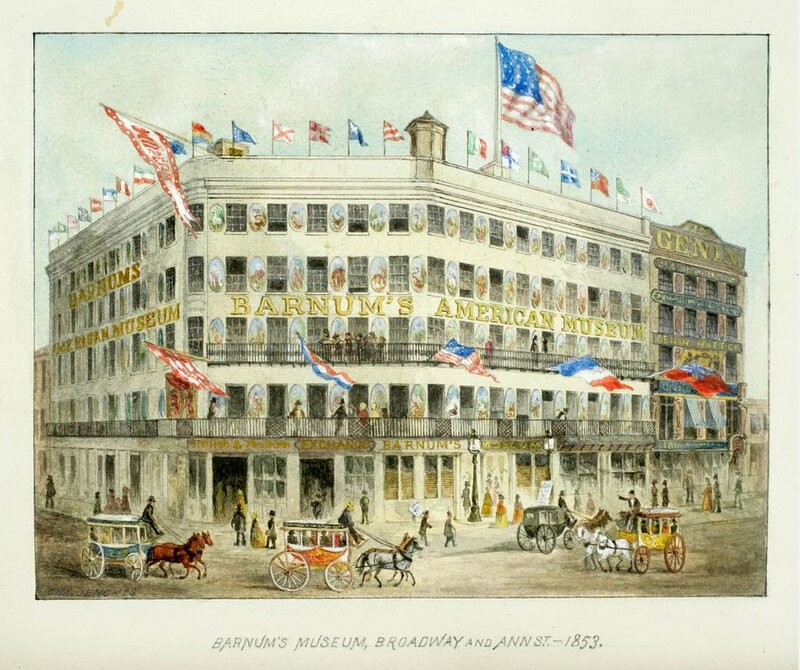 After a short time running a small general store in his early 20s, he moved to New York city and bought an old museum, which he renamed after himself, ‘Barnum’s American Museum.’ We’re in the 19th Century, so we’re not talking about museums as we think of them today. Today they’re exclusively educational establishments; in the 19th Century they were much more entertainment focused, or oddity focused. We’re in the era of the “freak show”, gawking at strange medical oddities and the like - stuffed animals, but then more strangely, stuffed animals with different bits of different animals sown together. His museum was not about accurately portraying history, or biology, it was about giving people a weird and fun day out. As such he made extreme and exaggerated claims, such as, he had a slave named Joice Heth who he charged the public to see, claiming her to be over 160 years old, and that she was George Washington’s nanny. When thinking about P. T. Barnum, or to give his full name, Phineas Taylor Barnum, we run into the same problem we often do with historical individuals: should we be judging him by today’s standards, by our moral norms, or should we be framing him within the context he lived in? Taking the example I just gave, he was a slave profiteer, but at the same time he recognised the need for change, and when the anti-slavery Republican Party was established in 1854, he joined immediately. Being very much the pragmatist, he felt very strongly in the means justifying the ends. If people came to his museum, and had a fun day, the misinformation to get them in the door was irrelevant. This morning then, as we think about Barnum, we are forced to consider the issue of moral ambiguity. Barnum does not conform to a straight forwards narrative. A few days ago was Black Friday, which has become another American import, a day to shop and get big savings. We’ve all see those pictures, of consumers stampeding each other to get 50% off a television. Black Friday, the day after America’s Thanksgiving is all about shopping. There’s a myth that the origins of the day come from turning off lighthouses. If a lighthouse is off how does it warn ships of the coastline? It can’t, and therefore you can never turn them off. So how then do you give them maintenance? The only way is to have an agreed upon day, that everyone knows, the day when all the lighthouses are off for repairs. It’s a nice idea. Sadly though, it is actually all about the saving you get in store. Lighthouse repairs are done during the day, so it’s not actually an issue. Still, even this myth plays into an interesting idea; we turn off the lights, we blow out the candles, not trusting that they will really show us the way, that they will really point us towards the good. The myth points us away from binary ways of looking at reality, and towards the ambiguity we all live in. As we bring to mind then those who are struggling on the margins, in the ambiguity, without a sense of true north, unable to see the lighthouse, unsure what the good is, we together try to foster upon the tumultuous sea a place of warmth and welcome. The P T Barnum Museam. You can hear from the second reading that P. T. Barnum may have been motivated by business, but it was certainly not his only passion. He took these theological questions very seriously. We heard in that reading how he hoped his Universalist Christian ideals would become more mainstream in the coming century. In actual fact he was writing at the height of Universalism. After the American Civil War, Universalism saw massive decline, and it was directly as a result of the Civil War. With such suffering (more Americans died in the Civil War than any subsequent war), the idea of a God not in some way punishing the evil deeds of humanity was no longer a palatable idea. So, the theatrical P. T. Barnum, he never thought small a day in his life. In his museum he also had live animals, elephants, lions, dioramas, scientific instruments, every weird and wonderful thing you can imagine, and more. A flea circus. A loom run by a dog. An aquarium, featuring a large white whale. The trunk of a tree under which Jesus taught his disciples. An oyster bar. A rifle range. As I said, not like the museums you get these days. He was the master of hype. Some even believed the word charlatan was more fitting, always ready to con people out of their money. There is a phrase wrongly attributed to him, “There is a sucker born every minute.” There is no evidence he actually said this, but the quote goes a long way to explain how people thought of him. In recent years, he has even been compared to certain US present. So it was, after 24 years his museum sadly burnt down. The fire itself was said to be prolific, a towering inferno, with all manner of animals leaping from the various windows. Police officers were called to deal with an escaped lion. Police officers were called to carry a 400-pound woman from the building. Despite Barnum’s loss, by this point, P. T. Barnum was 55 years old and had made all the money he ever needed. With success under his belt, he turned his attention to politics, writing, and establishing the circus he is now best known for today. He wrote a great deal, focusing primarily on three subject areas: himself, how to expose hoaxes (because after all he was an expert in orchestrating them), and finally the Bible, God, and his Universalist faith. Barnum spoke often about the love of God that he believed lay at the foundation of the New Testament. He believed it was unreasonable when reading the New Testament to make arguments based on isolated texts. That did not constitute an argument. When reading the Bible, it was necessary to discern the arc, the trend to which the Bible pointed. Barnum used passages like the one we had read out, which suggested that all of creation would be brought into harmony under Christ. An end goal which pointed us towards a God who was ultimately loving and forgiving. A God who loves us all. That heaven was not a place up in the sky, but a state of heart and mind lived into here on earth. In 1865, Barnum served as a Connecticut legislator, helping to ratify the thirteenth amendment, abolishing slavery in the United States. In a statement he gave, he declared that Christ died for all souls, and that all souls were equal in the eyes of God. Then in 1875, he served as the Mayor of Bridgeport, Connecticut, working to bring gas lighting to the streets, improve the water supply, and establish the city's primary hospital – Bridgeport Hospital – which still serves the people of Bridgeport. And then finally, in his 60s he set up the Barnum & Bailey Circus, which brought something of the spectacle of his museum to the rest of America. Again, by today’s standards his Circus was very questionable, but its popularity was unparalleled. Ultimately then, when it comes to Barnum’s legacy, we’re certainly left with a mixed bag; part charlatan, part con artist, part philanthropist, slave-profiteer, slave liberator. A man of joy and spectacle, who made a few bucks along the way. No doubt, like Barnum, to one extent or another, we will all leave mixed bag legacies. But if we arc towards love, and forgiveness, in the end all is made well. For Love triumphs over all else. Is this not our great hope also?